At Crossway Mechanical, we enjoy working on commercial and residential equipment and service and repair all brands of equipment. We have a top notch installation team who takes pride in the quality of their work. Crossway Mechanical provides all heating and air conditioner systems services in Magnolia, TX and surrounding areas. Check out what some of our customers are saying about Crossway Mechanical Services. Did a great job and very knowagable. Very professional and kept us informed. Very good professional, polite service person. Crossway Mechanical handles all my heating and AC needs and has for a few years now. Brian, Joey, Jose and David ALWAYS come through with prompt, professional and efficient service. I've shopped for pricing too and it is always good. I would highly recommend them for all your heating and AC needs. On Time and as they said. Took time to explain the issues and options plus explained the cost of our part vs. warranty. Only negative was the price of Freon seemed quite expensive. Always a great experience with Brian and Crossway Mechanical. Very trustworthy and thorough. Install new home heating system and zone control kit with zone dampers. Fall safety inspection on Amana gas furnace, verify operation and condition of unit. Check safeties, test drain and change media filter. Heating repair and fall safety check. Perform tune up on HVAC system that includes test thermostat for proper operation and calibration. Replace air filters and test safety controls for proper operation. Customer ac was not cooling. Found a leak in the condenser coil and will be replacing a/c system. New Amana 16 seer complete air conditioning and heating system. Helping another valued Crossway Mechanical customer by performing spring air conditioning inspection on Amana system using Imanifold reporting. Evaluate the performance and condition of system, test drain lines, insert pan tablets, wash outdoor unit. Diagnosed an issue with a furnace having no heat. Replaced a pressure switch and flame sensor for a Trane system. Made adjustment to correct airflow issue in the kitchen. 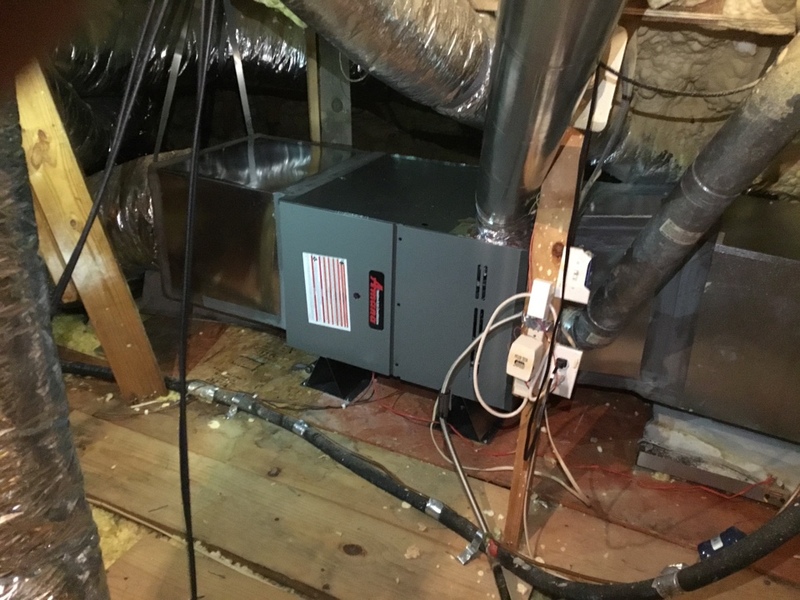 Helping another valued Crossway Mechanical customer by replacing old Lennox furnace with new Amana gas furnace.